Do you want to make more money? Do you want to be your own boss? Set your own schedule? 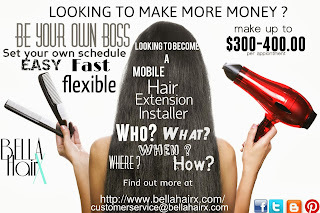 Have your ever considered being a Mobile Hair Extension Installer? Who you can become a Mobile Hair Extension Installer this mean you would put in hair extensions and you would be willing to go to the home or location of each customer who are willing to pay you to install their hair extensions. Prices for your services could range from $100.00 – $400.00 per appointment. Prices should set price based on how much you feel your time is worth, you may also want to include the pricing of travel time to your appointment. What you may need is the professional Hair Extension installation Tools and Accessories bag it would consist of tools like a color rings, etc. What you may need to do for advertisement you may want to use social media website like Facebook for those in your local area tell your friends to repost or help you get your business of the ground. You can also try other ways like Twitter, Instagram, and Pinterest . When can you get started? You can start whenever you feel like you’re ready to start making money. Where can you become mobile hair extension stylist? In your local area or whatever amount of distance you are willing to take to get to customers. However getting started is the first step also one of the easiest steps and that’s buying the needed materials for the job. You can purchase those supplies on our website and get a wholesale discount! extensions, you can learn form our personal website (www.myhairx.com), YouTube or other media websites.